Designed for iPhone 6s: Precision cut to provide maximum protection to the flat touchscreen surface for your iPhone 6 and iPhone 6s. Does not cover the curved edges. Ultimate Scratch Protection: Tempered glass effectively resists scratches from sharp objects such as keys because of its industry leading 9H hardness rating. HD Retina Clarity: Optically clear with high transparency and superior touch response maintains the original viewing experience and feel of the iPhone's Retina display. Smooth Feel: Feels just like your original glass screen. Also treated with an oleophobic anti-smudge coating so your fingers glide effortlessly over the smooth glass. 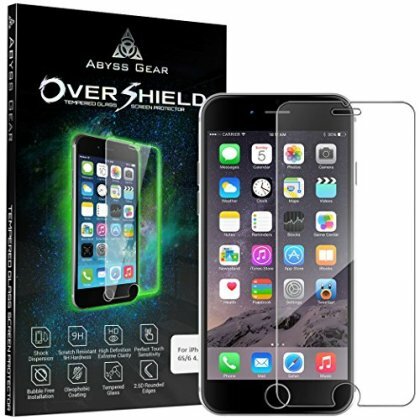 What You Get: Abyss Gear OverShield for iPhone 6s glass screen protector, bonus matte PET film back protector, alcohol and dry wipe, microfiber cloth, dust removal sticker, guide stickers, installation instructions (with video tutorial link) and lifetime warranty (just pay shipping for replacements).